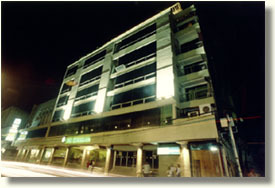 The hotel is located at the center of Bohol's downtown area, where the commercial district is situated. It's near to Bohol Quality Mall and Alturas Supermarket, where the two are only 10 minutes away by foot. I was glad to find out that most of their rooms have already been renovated. The walls are painted with a crisp white color, and the interiors are clean and simple. The hotel's being marketed as a business hotel, so I guess there's really no need for fancy decor. One thing I don't like about their rooms though is that most of them don't have windows facing the sun. If you need to wake up early, make sure to have the front desk ring you up or set up an alarm on your phone. The lack of sunlight makes you lose track of time. My deluxe room for Php2,250 comes with free breakfast, but they don't offer much. Their free breakfast consists of bread with jam or butter, fresh fruit (I got only one slice of mango), and choice of coffee or tea. If you want a heartier breakfast, you'd have to order from their menu. This hotel really has BAD service. I had a meeting there at the restaurant in the afternoon. Most of the waiters were idle since they didn't have a lot of customers. I asked them for a WIFI connection, and they said I had to purchase a card from the nearby convenience store for it. I asked if I could have it charged to the room instead, and they said that I couldn't. I really had to walk out there to purchase the card so I could access the WIFI. The idle waiters didn't take the initiative to buy it for me, or even to ask the front desk to charge the bill to my room. What's worse is that this isn't an isolated case. When I checked out, I specifically instructed the woman at the reception to split the bill since I checked out earlier than my roommate. When she handed me my bill, I was surprised that all the charges were printed out. She didn't even listen to my instructions. There are better hotels out there. If you're out to spend leisure time in Bohol, it is best to find a resort in Panglao rather than spend your time at a hotel in the city. If you're on business though and don't have the luxury of time, then you could consider MetroCentre. It's the one nearest to the commercial district and location is its only plus. Apart from its location, this hotel has got nothing much to offer.